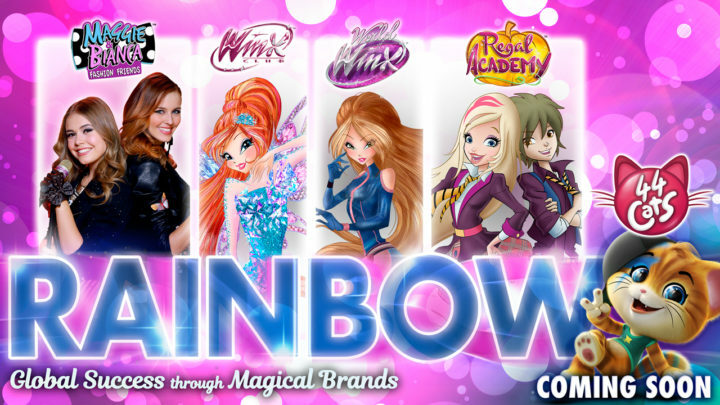 Content powerhouse Rainbow will light up BLE 2017 with three sparkling global hits: Regal Academy, Maggie & Bianca Fashion Friends, and World of Winx – an original series based on global smash-hit Winx Club. Rainbow will also showcase its hotly anticipated new brand 44 Cats – a CGI animation for young girls and boys that represents something genuinely unique for the pre-school market. Regal Academy is the hilarious, fresh and totally original show that centres on Rose Cinderella – the ordinary girl who found to her amazement that her granny was actually Cinderella! In series one, Rose found herself enrolled in the Regal Academy – the school for fairytale characters – and enjoyed a host of adventures with new friends Hawk SnowWhite, Travis Beast, Joy LeFrog, Astoria Rapunzel and LingLing Iron Fan. Thanks to the huge global success of the first series, series two has now been unveiled – with Rose returning from her summer holidays to find plenty more adventures waiting for her – a mysterious new student, a new hero teammate and the evil Snow Queen who wants to trap them all in her Snow Globes! The new series delivers a thrilling and funny joy ride that all the millions of Regal Academy fans – from over 100 countries where the series has been sold, as well as many new fans – will love! Maggie & Bianca Fashion Friends is the sensational pre-teen live-action show that has taken the world by storm through the funny and touching adventures of young American girl Maggie and Italian ‘princess’ Bianca, who meet at the Milan Fashion Academy. The series is so popular that three series have now been made, as well as two TV movies, and two music CDs from Sony. Also, the band from the show will entertain crowds throughout Italy on a live tour, starting on October 1st, with dates in major Italian towns cities. The show reaches millions of fans, through TV broadcast in Italy, Russia, Brazil, France, Germany, Greece, Poland and Benelux, and on Netflix worldwide. In World of Winx, the famous fairy friends must go undercover and hide their identities to outfox a villain called the Talent Thief – a mysterious and evil criminal who is capturing gifted children! The Winx must go undercover and hide their fairy identities – often with hilarious consequences – to outfox the Talent Thief, find his secret headquarters and protect the children of Earth. The show has been available on Netflix since November 2016 on a worldwide level and draws its inspiration from Winx Club – the classic property that Rainbow continues to invigorate with sparkling new contents. 44 Cats is a sumptuous CGI pre-school animation about cats and how they see the world. The show is a great physical, character-driven comedy with strong storylines based on very powerful musical assets. Young children, both boys and girls, can easily relate to the key themes of friendship and altruism and the magical stories that promote tolerance, diversity, and offer important life-lessons.